Stay tuned for upcoming events for FAST Alumni Homecoming in near future. FAST Alumni Homecoming 2018 will be held on 20th January 2018 at National University of Computer and Emerging Sciences (NUCES) in Lahore. It is organized by the Old Students Association of FAST (OSAF). Quratulain Balouch (QB) will perform her melodious music live. Alumni Homecoming '18 is here to bring you back the cocktail of memories and emotions, just the way you left it at FAST. Presented by OSAF, the Alumni Homecoming provides opportunity to FAST Alumni to have a get together and share thoughts, knowledge and experience. Alumni are invited for a reunion to celebrate, apprise and interact with old friends and make new ones. 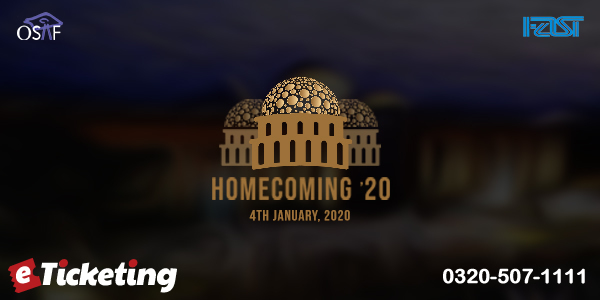 This homecoming will be a chance to meet up and network with your batch mates and instructors. It will also be an opportunity to see how the university has transitioned and grown over the years. Coupled with that are various evening attractions of food, fun and music, but you have be there to enjoy it. So come forth, share stories about how you got started and where you are now, in a very affable and conversational setting. Clear your schedules and come join us for a memorable evening. This event is for FAST Students & Alumni ONLY. University Batch/Year, Roll No. and Date of Birth will be required for Alumni Validation and Issuance of the tickets. Old Students Association of FAST-NU (OSAF) is the Lahore Chapter of "FAST-NU Alumni Association". OSAF is an association of ambitious graduates of FAST-NU, Lahore Campus, who want to work for the betterment of FAST-NU, its students, Alumni and their society. Main Objective is to establish an organisation that brings together and fosters a beneficial relationship between the Alumni and the students of FAST-NU. Terms & Conditions : OSAF preserves the right of the admission to the venue. Only FAST Alumni & FAST community are welcome to reserve the tickets and attend the event. Best Viewed at 1024 x 768 pixels and above. This Page loaded in 0.09031 seconds on Tue, Apr 23, 2019 (21:24).